FIDA (First Indian Detective Agency) is a reliable Private Detective Agency in India, Delhi and was incorporated 15 years ago. We are known to serve the clients with the best deals on Pre Matrimonial Investigation, Post Matrimonial Investigation, Loyalty Test Investigation, Surveillance Detectives, Divorce Cases Investigation, Background Check as well as Employment Investigations and so on. This is completely depends upon your requirements and you just need to seek the assistance from the professionals of the agency. 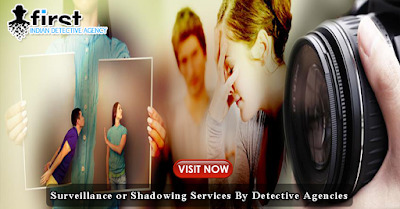 We do have a team of dedicated and experienced detectives who will serve you with the needed solution for the related cases FIDA is the best Private investigation agency . Our experts follow the best industry standards for investigating the cases; this is why, we are the highly acclaimed and demanded in the industry. We are serving Indian clients with different types of investigation cases since last 15 years and hence, we do have expertise in the same domain to serve the needed people with required solutions.